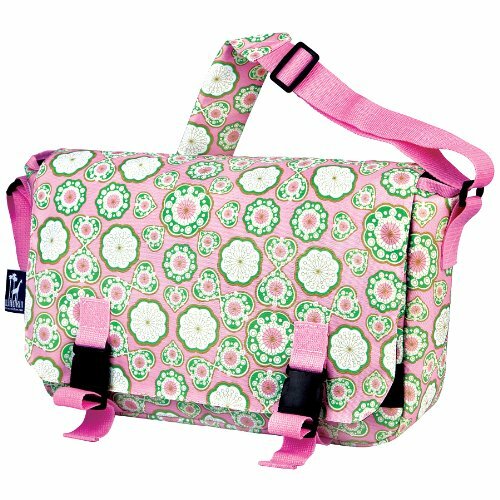 If you want something cheerful that can accompany even the most challenging days at school or why not at work this bag might be an idea for a gift or for yourself.It ‘a bag (Wildkin 54114) which is particularly “girly” with pink and drawings from geometric theme. It is made of fabric with a form that ends with a flap that closes through two practices snap closures. Her measurements are: 10in. x 13in. x 4in. It is equipped with two flat pockets in the external front, below the patella, which are useful for storing objects you need to find with more ease or immediacy. The interior is lined in solid colors, and roomy. In addition to the main compartment, there are of the pockets specially designed to hold pens or pencils and objects such as phones and block notes that would otherwise be difficult to find when the bag is full. The bag is worn through a practical adjustable strap that has a special padding at the shoulder to avoid fatigue when carrying a full load for more time or at least to have both hands free.